Tuesday’s Tootin’ My Horn for Darakwon! For those of you on Facebook, I apologize for bombarding you again with what came in the mail yesterday. Well, technically, it didn’t come in the mail. I was following the Beneficent Mr. Hall out of the neighborhood (he had to take his car to get a tire fixed) and the mail person jumped out of her little truck and flagged him down because she had a package that required a signature. (She’s a pretty swell mail person!) So he signed, grabbed the package and off we went to the garage place. But when we stopped, he handed me the package and then I knew! My books from Darakwon! All the way from Korea! Except we still had to drive all the way across Gwinnett County to pick up the Libster and I’d promised to go with him. See, the Libster was staying with his doggy friends (and Uncle Jimmy and Aunt Cappy) while Mr. Man drove down to Savannah to pick me up, so really, it was the least I could do. But did you know that Gwinnett County is the size of Rhode Island? Absolutely true. The county where I live could fit into that state. And we had to drive across the county, through road work (because they’re always working on a road somewhere in Gwinnett County) and the BUSES. Fortunately, I had my handy-dandy 87-in-one tool and I whipped out the scissors and went to work on the box while the mister drove. Finally, I pulled out A Gallery of Ghosts! A book! With my name on the front! (Yeah, it’s teeny, tiny letters, but it’s there, right on the front. Under the title. Just squint a little and you’ll see it.) It’s been about a year and a half since I wrote this leveled reader, but I’d worked on the editing process back in the early spring. Still, I kinda teared up when I read that story all over again. I just love that story about overcoming obstacles. And Darakwon had done an excellent job. 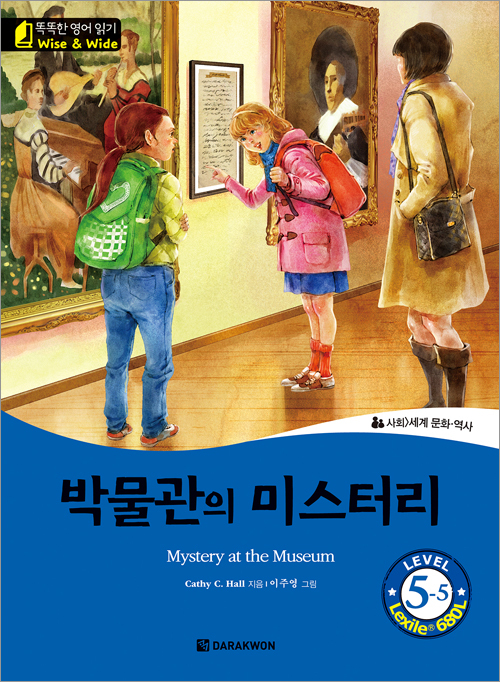 And then I pulled out the second book, Mystery at the Museum! And I loved it, too (even though I wrote it myself)! I learned quite a bit about the Renaissance, writing that book, and I was thrilled that they were able to add so many wonderful photos and drew illustrations that matched what I had in mind for the museum. I began reading one of the books aloud to the mister (we were still driving to get the Libster–I told you it was far) and he tried to act as if he were really interested. But then I got a little worried that I might put him to sleep and I didn’t want to drive, so I just read to myself and sighed contentedly. 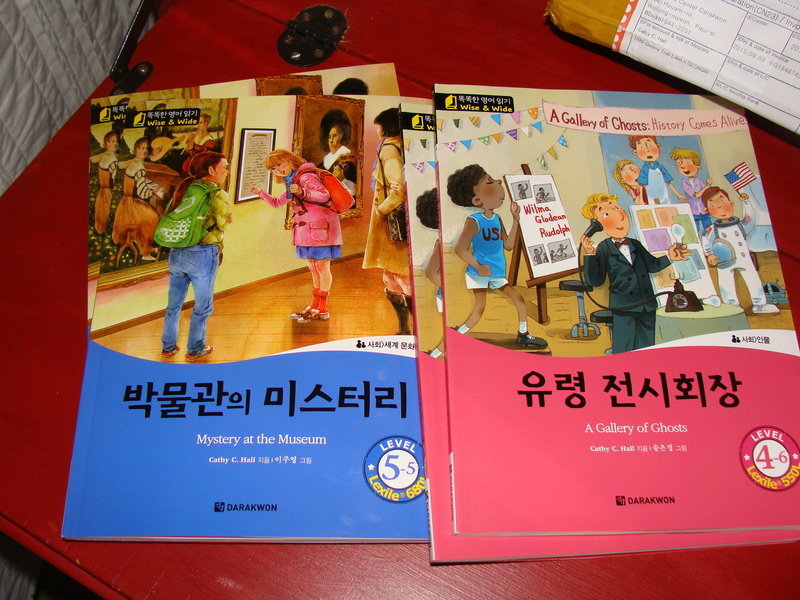 Gosh, I hope the Korean students like these books as much as I do! Eventually, we arrived at our destination, fetched Libby, and started the drive home. The mister then decided to take a different way back (to avoid the road work) and the GPS refused to cooperate and so we got a teensy bit lost (and of course, there were more buses) so by the time I got home, I just had time to throw the pictures of the books up on Facebook before the Falcons game because I had to scream somewhere (I mean, for the books. I screamed at the Falcons, too, but that’s another story). Anyway, Monday is not Tootin’ My Horn day here at Cathy C. Hall’s. Tuesday is much more alliterative and all that jazz, so like I said, sorry if you’ve heard the news twice now. But it does seem kind of fitting, being as there were two books. I bet there’s some website or app or other tech-thingy that could translate your author bio for you…. Fantastic! 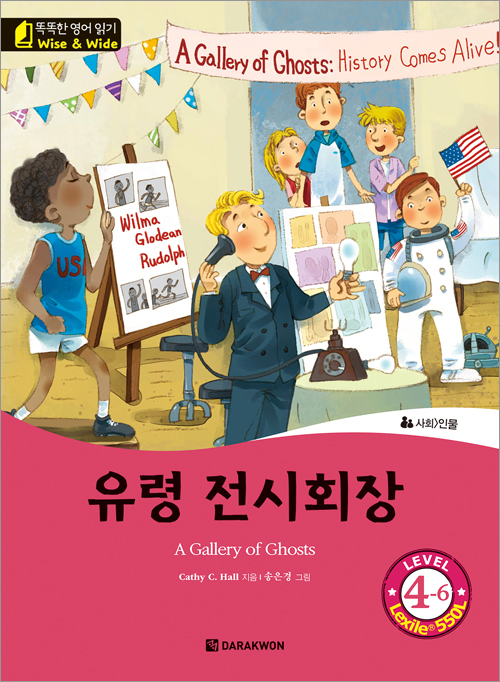 Teachers of Korean language learners thank you for writing leveled readers with actual plots. Way to go! Thanks, Thomas! They don’t have quite the humorous style as my other works–that would’ve been lost in translation–but I think they’re entertaining. Sure hope the Korean kids agree! Toot! Toot! Congratulations! Love the art for A Gallery of Ghosts. Thanks for letting us know. Thanks, Joanne! I loved that art, too! Do you have any buttons left on your shirt? I’d be busting mine too if my books were in Korean kids’ hands. So proud to know you, Ms. Cathy. Congratulations. Congratulations, Cathy! I’ll keep my eyes open and let u know if I see these in a bookstore! I’ve never heard of this publisher–just googled them. If I ever get to Korea, I can do a book-signing, right?! Thanks, aj! Way to go! Congratulations! So exciting. Oh, thanks, Lynn! It HAS been pretty exciting! Congratulations, these look so cheerful. Way to go! Thanks, Diane! So nice to see you here! They’re gorgeous! I love the color illustrations. 🙂 I’m excited for you! How many others do you have in the works with Darakwon? Whoohoohoo! I’m just catching up on my blog reading and I saw your post! CONGRATULATIONS! Doesn’t it feel great? They do such a good job on the books. Yes, I do believe that the Korean kiddos will love your books as much as you do. 🙂 What are the topics for books 3 and 4? Aw, thanks, Suzanne! And I mean that with a capital T! 🙂 The third book is on psychology–that was a hard one!–and the next one…I’m not sure yet. Thinking up ideas but probably something with an historical bent.